In a surprising series of upsets, three players, all under 16 and who turned pro earlier this year, have defeated some of the top-rated Korean players. Byun Sangil 2P (right) was born in 1997 and became a pro in early 2012; he’s currently ranked number 18 in Korea, and recently played in the Bailing and Olleh KT Cups. Shin Minjoon 1P (left) and Shin Jinseo 1P (below right) both became pros this July at the “Prodigy Pro Draft qualifier for ‘young talented students under 15.” They were born in 1999 and 2000 respectively. 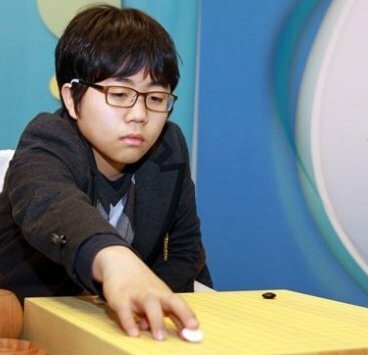 Top players Lee Changho 9P, Lee Sedol 9P and Choi Cheolhan 9P each agreed to play exhibition matches against the rising stars. 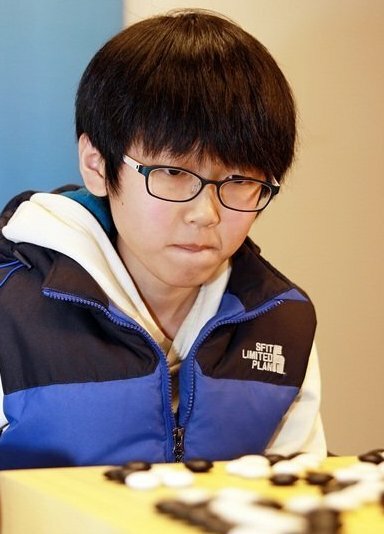 Unexpectedly, Lee Changho and Choi lost to their respective opponents, Shin Jinseo and Shin Moonjoon. 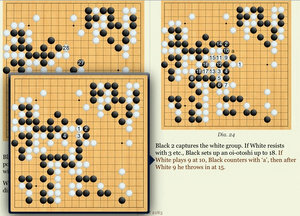 Lee began his game with an old-fashioned opening, and took the lead, but had the game reversed through the middle and end games. 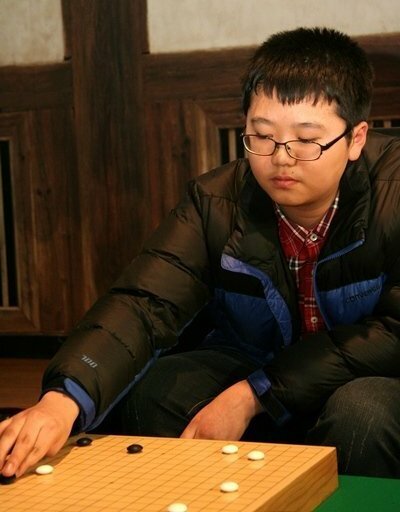 Choi’s style of play is aggressive, and served him well when he defeated Shin in the preliminary rounds of the GS Caltex Cup. However this time Shin was about to seize on an early opportunity and held up through the endgame for a 2.5 point win. Lee Sedol was the only pro who managed to hold off his opponent, defeating Byun Sangil, his former student, by half a point. 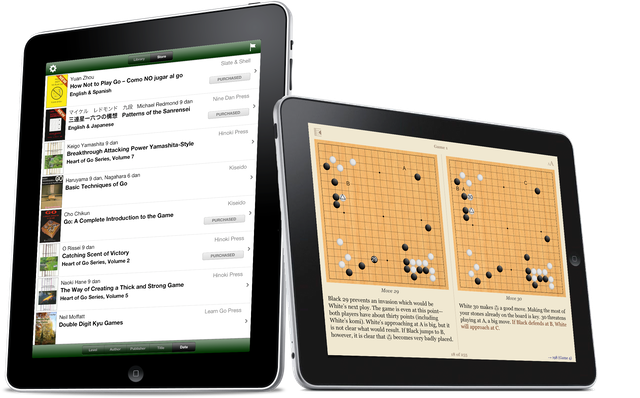 It’s going to be a busy online go weekend. On Friday, go fans can watch Myungwan Kim 9P comment on the Bailing Cup live on Tygem, as Chen Yaoye 9P (left) — down 0-2 — tries to stay alive in his battle for the title against Zhou Ruiyang 5P. 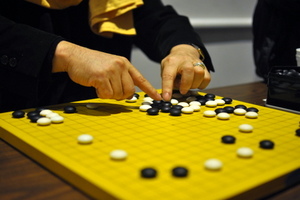 And on Sunday, Andy Liu 1P will play Lee Sedol 9P on go9dan.com. Kim’s commentary starts at 8:30p EST Friday, January 18 on the Tygem World Server, while the Liu-Sedol game is at 8a EST on Sunday, January 20 on go9dan.com. 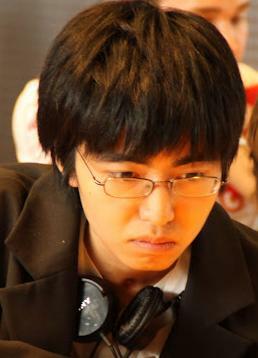 In his online reviews of the first two games, Kim said that although Chen, currently the top player in China and considered one of the strongest players in the world, was expected to have a slight edge, “he was not able to stand up to the pressure of the championship series.” Zhou on the other hand, the number one player in China in 2011, has handled the pressure well, Kim said, “perhaps because he has played in a world championship once before.” In this best-of-five Cup, Chen will have to win all three of the remaining games to win the $300,000 prize and the international title. Whoever prevails in the series, the winner will have his first world championship. At the upcoming January 26 Jujo Ing Cup, sponsored by Ing’s Goe Foundation and organized by the Bay Area Go Players Association, players can not only compete for $3,000 in prizes, but strong players also have the chance to earn points to qualify for this year’s North American Ing Masters (NAIM) tournament. This year’s NAIM will be held at the 2013 US Go Congress, set for August 3-7 in Seattle-Tacoma, WA. The Jujo Jiang Ing Cup will serve as the first Western region qualifier. 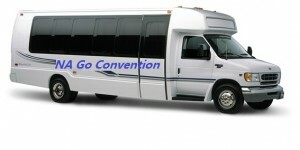 Register online before the event and receive a $10 discount: click here to register. Your Move/Readers Write: Android for SmartGo? 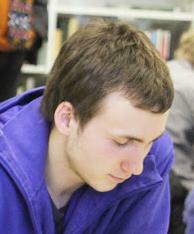 “I want an Android app for the smart go books!” writes Lee Frankel-Goldwater. I knew I was in trouble as a game recorder when I saw the draw for Board 2 in the final round of the Gotham Go Tournament last Saturday. In the other corner is the champion of speed himself, Andy Liu 1P, who often uses his speed as a lethal weapon. In the World Amateur Go Championships a few years back, where each side got an hour and a half of basic time, Andy’s strategy was never to use more than 10 minutes, keeping his opponents under constant time pressure. On top of that, Andy loves to play ko’s. In a ko, every third move is obvious, but the recorder still has to enter it. The ko threat may be in almost any area of the board, so if you miss it, it can be hard to find. Then the response is also obvious—another chance for a quick move. As expected, the game starts fast and doesn’t let up. At move 47, Chris Garlock, recording on Board 1, says to his audience, “Wow, stones are flying on Board Two…John’s gonna have his hands full keeping up.” An accurate assessment, but things were about to get even more interesting. Kyoung holds up the clock and says, “You don’t need this, do you?” He starts to explain, adding “I mean, you play fast.” But without a moment’s hesitation, Andy has already shot back “Absolutely not.” In other words, game on. As Kyoung turns off the clock, I’m mentally groaning, thinking uh-oh, someone’s going to crash and I just hope it isn’t me again. Eighty moves fly by in the blink of an eye before there’s a pause as Kyoung says “Oh my god…I made a reading mistake.” As he and Andy begin their review I breathe a silent sigh of relief as I type in the words “White resigns” and wrap up our KGS game broadcast. NOTE: Complete Gotham Tournament standings/results have now been posted on the Gotham Go Group’s Facebook page. The ongoing development of electronic publishing is often framed as a battle to the death between two formats, hard-copy versus electronic. But the reality may be more complex, as creators and users seek to maximize the advantages of both formats in a rapidly-changing technological landscape. Jason Clancy 6k (at left, in green sweater) took first place at the January 13 Massachusetts Go Association Winter Tournament, topping a 24-player field that ranged from 4 dan to 20 kyu. “Twenty three players pre-registered,” reports Tournament Director Eva Casey. 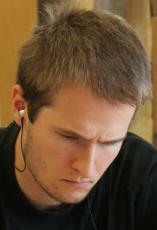 “Three of those were no-shows, so twenty players got the pre-registration discount. The majority of the players joined or renewed membership in the Massachusetts Go Association, thus meriting an additional discount.” Casey thanked the Boylston Chess Club in Somerville for use of their premises. Winners: First Place: Jason Clancy 6k; Second Place: Elliot Stern 7k; Third Place: Alex Linden 12k. 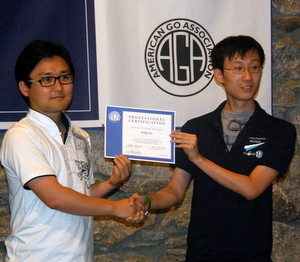 Zhaonian (Michael) Chen 7D (right) won the Gotham Go Tournament January 12, topping a capacity crowd that filled the Soho Room at the historic Hostelling International New York on Manhattan’s Upper West Side. Chen’s 4-0 sweep earned him the $300 top prize and included a convincing win over Andy Liu 1P (left) in the second round. Liu took second place and Kim Dae Yol was third in the open section. 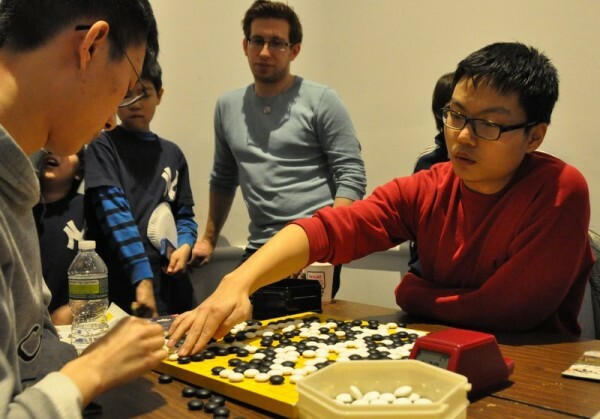 The field included a healthy mix of new players and “old-timers” who were happy to see tournament go returning to the New York go scene after a multi-year drought. The tournament drew from as far away as Washington, with DC organizer Haskell Small 2D making the journey up to play, and as near as 106th Street, as former AGA President Roy Laird 3K walked over to join the festivities. 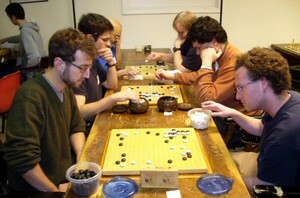 The American Go E-Journal’s Chris Garlock and John Pinkerton broadcast top-board games (see links below) on KGS with live commentaries by Gansheng Shi 1P — who also did live audio commentary, which was very well-received by nearly 200 players — as well as Hugh Zhang. Tournament organizer Peter Armenia — who even got a round in himself — pronounced himself “pleasantly surprised and very pleased” at the turnout, which included a half-dozen top-ranked players. “Thanks to everyone for coming out,” Armenia added, “we hope to make this a regular event, so stay tuned!” Matthew Hershberger directed the 4-round tournament. Other section winners were: 3D-1D: Willis Huang 3D; 1K-4K: Todd Blatt 1K; 5K-9K: Gino Choung 5K; 10K+: Yuga Suzuki 12K. Look for complete results to be posted soon.